We are in Salzburg, a beautiful old town with a big fortress (Hohensalzburg). For a nice view over the fortress we go up the Kapuzinerberg. Normally a walking path, but we push our bikes up all the way up. Hard work for a nice picture 😉. That night we stay with Patrick. In the afternoon we meet at his house. He gives us the keys of his house and leaves again. We make sure that dinner is ready when he returns home by 9 p.m. We eat, drink and talk about traveling. Patrick already made seven trips per bike to the Balkans. He advises us to go to Slovenia via Italy. 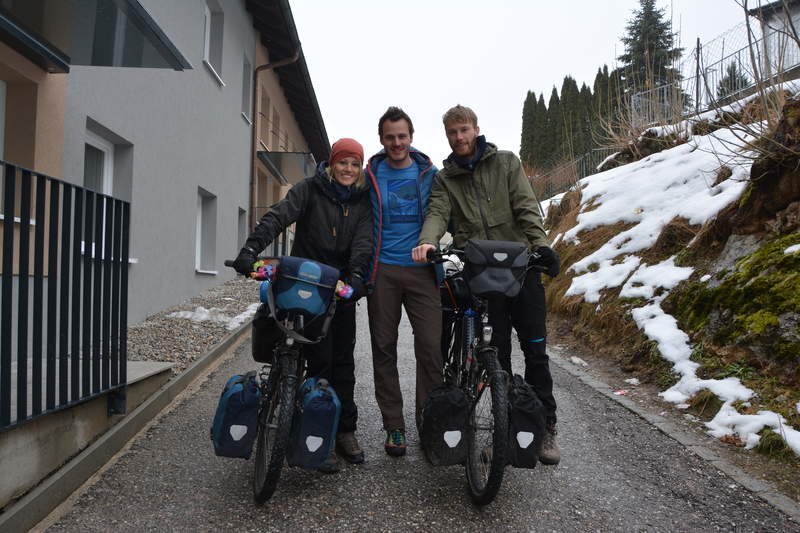 We planned to cycle the Würzenpass, a pass directly from Austria to Slovenia, but in winter it’s not a good idea. Many mountain passes are not accessible and in Italy we will encounter less mountains. The next morning he prepared a great breakfast. After that we were ready for the real work, the Alps! Cycling in the Alps is sometimes difficult and definitely not fast, but thanks to the beautiful winter landscapes it was worth it. We were lucky that the weather was good and no fresh snow had fallen. We also planned to cycle about 50 kilometers per day, which made it more easy to climb the mountains. 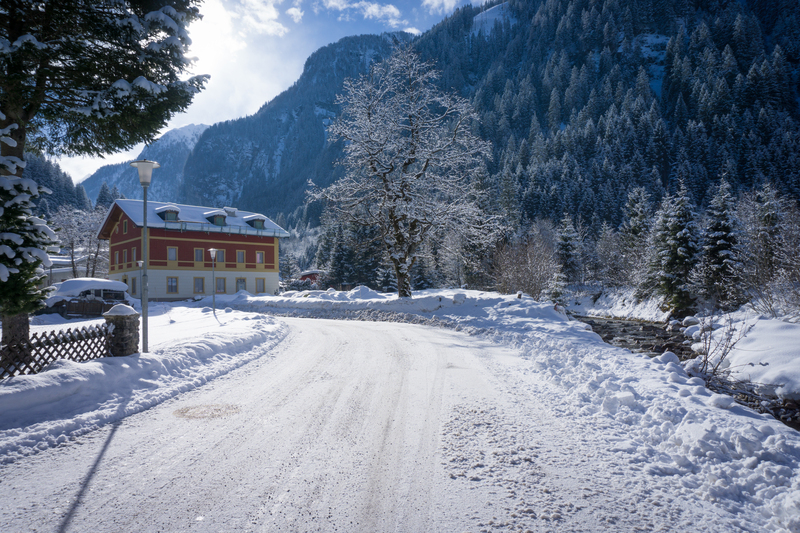 Patrick in Salzburg and Thomas in Bad Gastein, thank you for your hospitality! After a ten minute ride we get off the train in Mallnitz. We are on the other side of the Alps and the weather is different. The sun was still shining other side and here it’s snowing. We also notice that it’s more quiet on the road and in the villages. The first few days we do not descend much and we camp for two more nights, in a thick layer of snow. 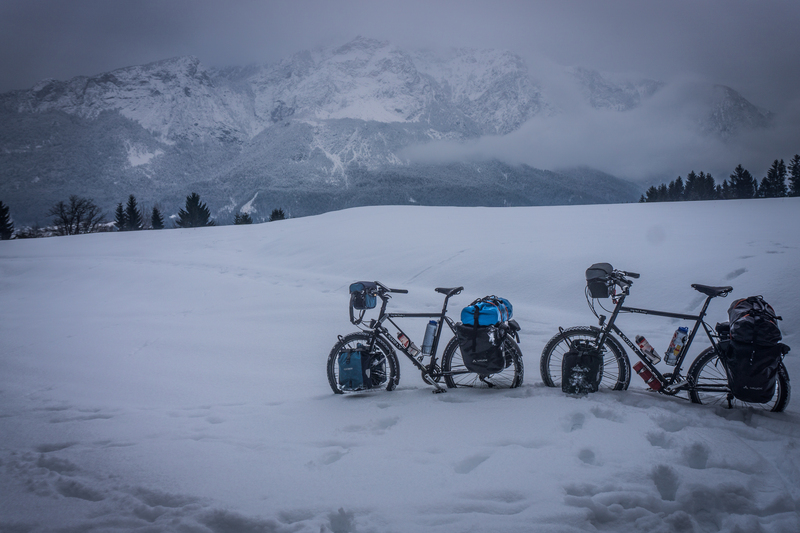 It is difficult to find a good camp spot here, because it is very hard (almost impossible) to move the bikes in the snow. When we pass the border with Italy a man stops his car and he takes pictures of us. He tells us that in Pontebba (in about 30 kilometers) the snow is gone and he is right. From there we go back to the cycle path. Later we found out that he has published the photos on his website, click here to read his message! 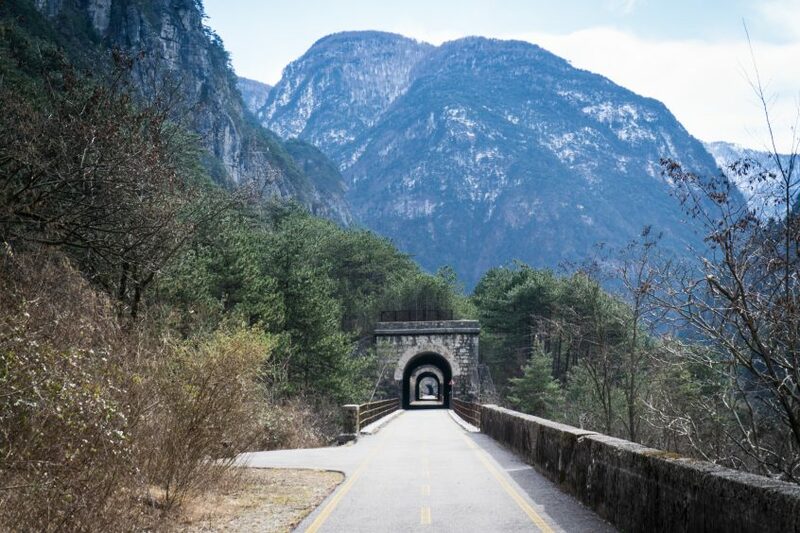 The Alpe Adria Radweg (Ciclovia Alpe Adria) follows an old railway line from the border. 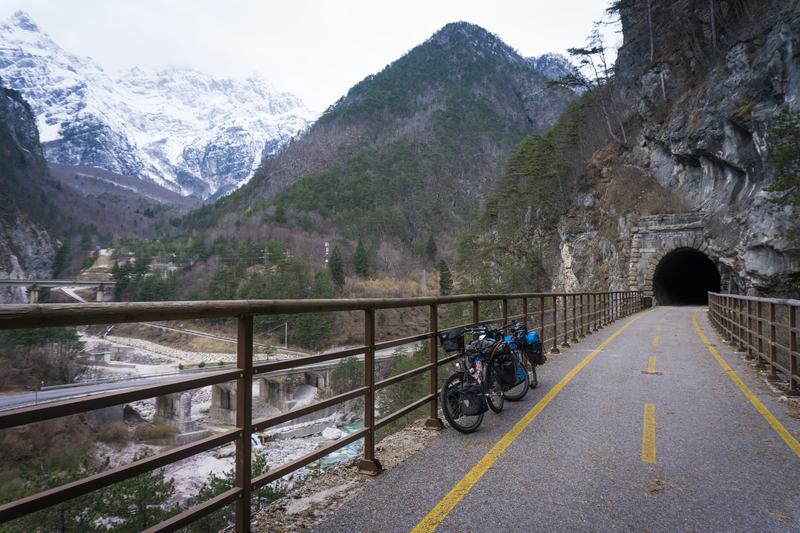 Officially, the route opens in May, because there is no lighting in the tunnels in winter. 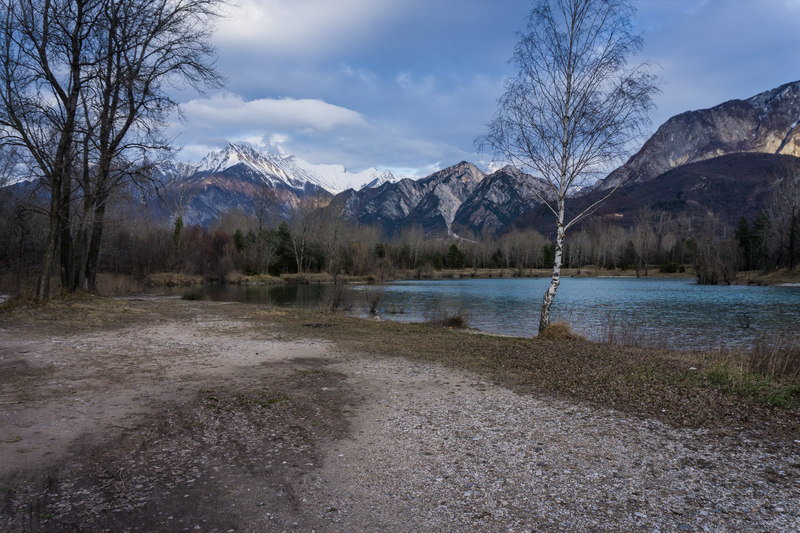 We decide to follow the cycle path anyway and it turns out to be a beautiful road, which mostly goes down, with a river and the Alps in the background. It’s around 10 degrees, the sun is shining and it feels like spring. We picnic with a view over the snowy peaks. Especially these moments we really enjoy. This is why we are cycling! When we zip open the tent we see that everything is white. It has snowed again and the feeling of spring we had yesterday is completely gone. But, we are going towards the sea and there the weather will be better. Along the way we are encouraged by many Italians: ”complimenti, complimenti!”. Cars are honking and people raise their thumbs. At the bakery we get extra sandwiches and cookies for on the way. Very nice to get all those comments! We reach the Adriatic coast near the town of Monfalcone. Staying here is still very expensive so we decide to set up the tent for the fifth night. Unfortunately, there is no way to place the tent somewhere unseen. Along the coast there are many buildings and nowhere is a flat spot. Just before the big city of Trieste we decide to go up a mountain. We push our bikes to 340 meters altitude, where we have a beautiful view over the sea and the city. After an hour and a half searching, we finally find a small plateau where the tent can be placed. It is already dark and we no longer feel like cooking, so we go to bed right away. 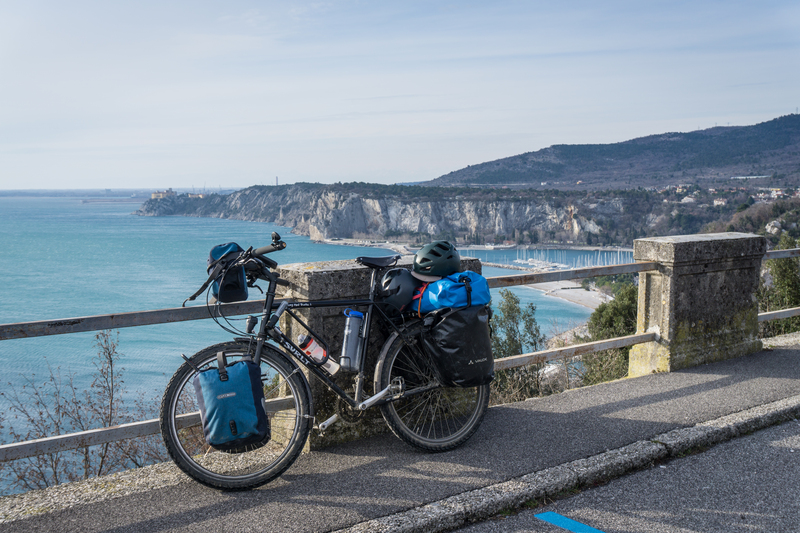 The next day we cycle along the coast from Slovenia to Croatia. 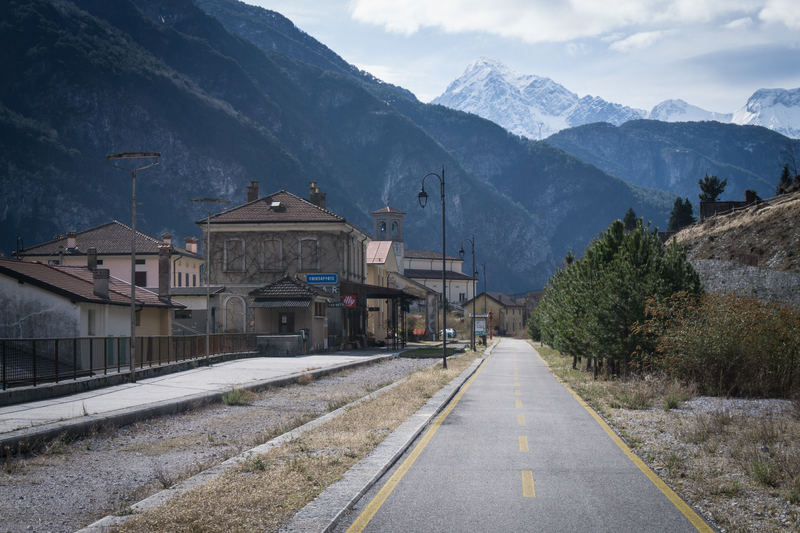 Here we find another beautiful cycle route, the Parenzana. This route also follows an old railway line from Trieste, Italy, to Poreč, Croatia. We now notice that we are getting into a different region, stalls with fruit and grilled pork along the road, and more rubbish in the ditches.. The next three weeks we will cycle through Croatia, along the coast to Montenegro. The weather forecasts are not good, a lot of rain and wind is expected. Hopefully it will not be too bad! We try to share a few photos every day through our Instagram Story. We get a lot of nice comments, thank you! Last month, however, we quickly ran out of data. Don’t worry, we are OK 😊.